Our friend Mark Abbott-Compton over at www.learn-how-to-garden.com has put together this great tutorial on how to build your very own Hot Bed using a WoodBlocX Raised Bed. It's a technique that the Victorians popularised throughout the UK many years ago, but is just as effective today! Used since Roman times with a cold frame on top, Hot Beds were once quite common as they are an effective way to grow many tender crops. A Hot Bed is also quite ecological because instead of burning fuel or electricity it produces its own heat by fermentation. Victorian gardeners managed to raise almost every sort of exotic crop you can imagine, and continued to use them to grow conventional crops well out of season. A Hot Bed covered with a small glass cover (also called a hotbox) acts like a small version of a hothouse or heated greenhouse. 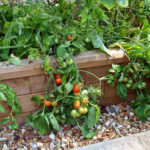 A Hot Bed created from a WoodBlocX Raised Bed can revolutionise your own vegetable growing and you could be harvesting salads in March and potatoes in early April. By reviving and modernising this ancient vegetable-growing method with WoodBlocX, you will be able to produce healthy plants that crop at least two months earlier than conventionally grown vegetables.